So… Has anyone REALLY ever died from eating cookie dough, or is someone out there just trying to damper our hopes and dreams? This is an honest question. I cannot tell you how many spoonful’s, cups, even POUNDS of cookie dough I have consumed in my life, and I’m relatively normal! This whole salmonella thing (or salmon-In-Ella, as I pronounce it), is it real? TO THE INTERNET!!! According to the CDC salmonella is estimated “to cause one million illness in the United States, with 19,000 Hospitalizations and 380 deaths.” Oh. Well. What’s my chances that I’ll actually get it… I might take them all for the love of the dough! In my 24 years I have tried a lot of dough, in 2012 I was on the quest for the perfect low-fat chocolate chip cookie recipe. I strongly believed if the dough tasted good the cookie would come out good. You see, there is one problem with that theory, all cookie dough taste good, and even when it doesn’t taste spectacular it is still not that bad!!! I strongly believe that cookie dough is the reason that I will never have abs. I can run 8 to 15 miles a day, and come home and “make cookies”, end up eating a good quarter cup of dough and wake up wondering why my weight loss plan is not working. Well, maybe I will add a mile or two to compensate for the doughy desire that I need to fill. While today’s creation will not help your diet, it will not make you die of Salmonella and that’s a promise! 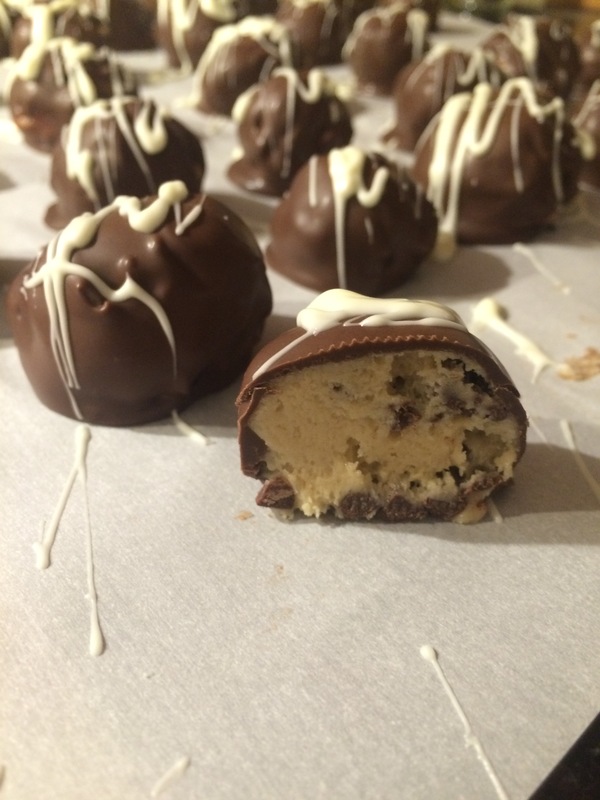 This cookie dough is eggless, super creamy and covered in chocolate, what more could you want? This is the first time I ever made a cookie dough with sweetened condensed milk and I might look into using it more in the future, the dough is super smooth and creamy, what dreams are made of. If your sweet tooth does not include a love for super sweet, sugary, creamy goodness, do not even bother with this. While it is perfect for the cookie lover, the average Joe of desserts might not find these too amusing. Kids, young adults, and all of my coworkers came begging back for more, and hopefully you will too! Special Shout out to Zach who submitted this idea! Have your cake and eat it too with these delectable truffles. Egg free will leave you worry free and quickly floating on a bed of happiness and chocolate. Makes roughly 4 dozen. Using a mixer cream together butter and brown sugar, make sure to mix till smooth, no brown sugar clumps! Mix in flour 1 cup at a time until incorporated. 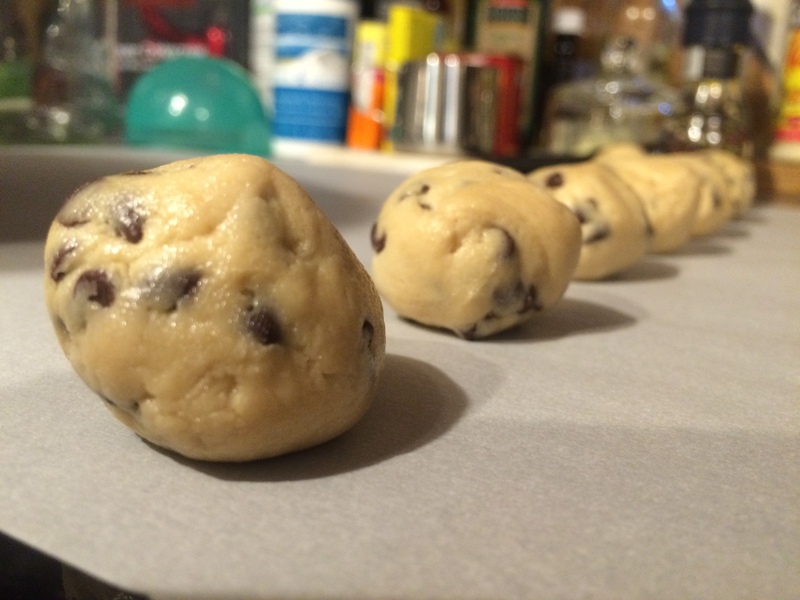 Mix in sweetened condense milk until smooth and incorporated with the dough. Stir in chocolate chips to taste. 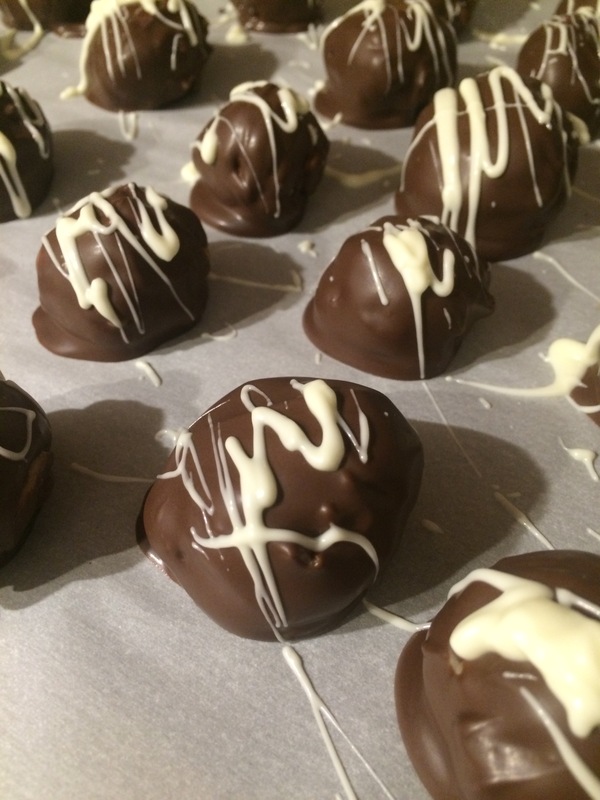 Place the balls in the fridge until the chocolate is melted. 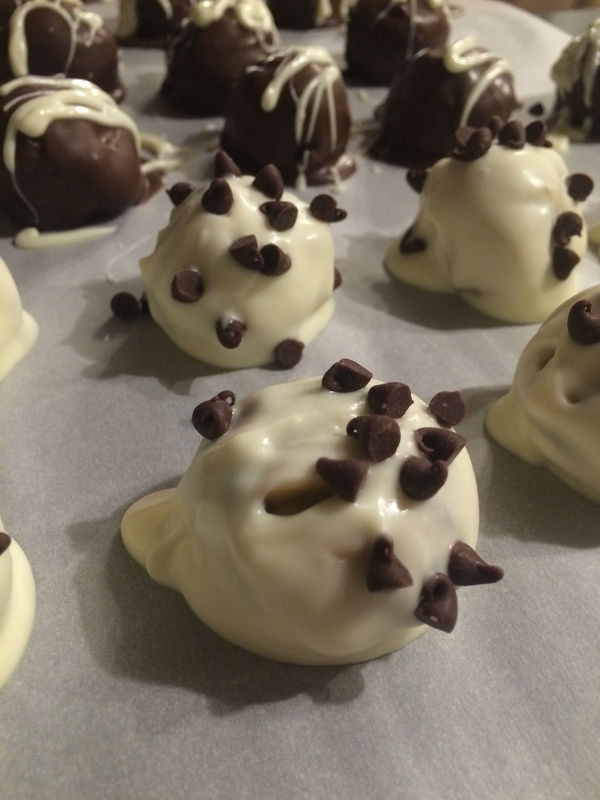 Using a toothpick or knife stick the balls into the chocolate until covered, remove and place on wax paper to dry. Once dry, keep refrigerated until ready to serve. Best if eaten within 1-3 days of making.